What did you like best about Summer at Willow Lake? What did you like least? I could not get through the the first chapter so I am totally unqualified to give an opinion about the story. The reason? The narrator was HORRIBLE. I just finished wiggs' Bellavista books on Audible and they were great! Loved the stories, the characters and the narrator. I felt like a found a new favorite author to listen to-- perfect for my gym sessions. I couldn't wait to start the Lakeshore Chronicles. But, sadly, that's not going to happen because it looks like they all have the same narrator. Her voice was just not right for this story. The bus would arrive at summer camp and lots of kid's would hop down the steps of the bus, eager to start their summer vacation. The camp was owned by Olivia's grandparents. Olivia and Conner had sat next to each other on the bus. Therefore, as a team of two, they climbed up a hill, stopping now and again to look around and talk. Olivia was over weight, wore big glasses, her hair was braided into pig tails and thought that no one liked her. She would be having a tougher time this year because her cousin's were going on a road trip with their parent's to California. Olivia felt lost without them because now she wouldn't have anyone to hang around with. Olivia wasn't good with stranger's. She didn't know what to say and when she did speak, her words were unkind. The camper's would reunite each summer and that was how Olivia and Conner made a connection. However, the last summer they spent at the camp there was a misunderstanding about their feelings towards each other. Each went their own way and found their themselves away from one another. The camp had been closed for many years. Olivia's grandparent's had been married at the camp and wanted to renew their vows on the same spot as they had done fifty years before. However, there was a huge problem. The camp needed someone to orchestrate refurbishing it, due to its lack of use. Olivia was called by her grandmother and asked if she could spend her summer doing just that. Olivia now owned her own business, Foundations. The purpose of Foundations was to refresh homes to look nicer than they actually were, for a quick sale. Olivia and her employees would buy furniture and such to inspire those who were looking to purchase a home. They may buy a painting, antique tables or rearrange things that were already in the home and the homes sold faster because Foundations had renewed the spirit of the home. Therefore, knowing this, was why Olivia's grandmother told her she'd be the perfect person to get the camp in shape for renewing their vows. The language was fairly tame. The word f#### seems to appear in every book that I've been reading lately and the lead character, man/woman, has red hair. The book was a smooth and easy listen. The character's were not very developed. The story was calm and predictable, it was a gentle love story. This genre of book is enjoyed by many and they would not be disappointed if they purchased this book. The narration was very good and that always makes for a good read. I loved this book. Small town setting, by a lake, second chance romance, large family with great relationships - it had so many of the things that I love in romance series. I love Olivia and Connor as characters. I love that their relationship grew steadily while I was able to find out about their past history thru flashback chapters. They had a Big Major Event that happened years ago that left them disconnected, but they have coincidentally reconnected to work together on a huge summer-long renovation project. Of course, they grow closer throughout the duration of the project, and due to their past history, this is sort of a second chance romance. The secondary cast, comprised mainly of Olivia's family, is great and I'm excited to continue with this series and read the stories featuring each character. The narrator is okay. I see mixed reviews but I really did enjoy this audiobook. The male voices aren't the best but this won't keep me from continuing this series on audiobook. I already have several of the titles in my library. I would recommend this one and, yes, I think it's totally worth a credit. I'll for sure be re-listening when I revisit my "summer reads" lists in the future. Easy reading - keeps your interest. I think that this book would interest - high school age to Grandmother age - most women can relate to at least some of what the characters have gone through in life. The story was decent and entertaining but the male narration did was terrible. The main male character was described as very masculine and brawny yet his voice was almost feminine and whiny, which ruined his effect. Disappointing. I really liked the Apple Orchard by Wiggs. I purchased another one of her books but it was by a different narrator and I simply could not stand her slurring S's and voice for the male character. I had to return the book. I will purchase a copy for my Kindle and read it on the beach this summer. If you’ve listened to books by Susan Wiggs before, how does this one compare? I couldn't get through it. Not the author's fault. Anyone but Bean! I cannot listen to slurry S's. What did you love best about Summer at Willow Lake? 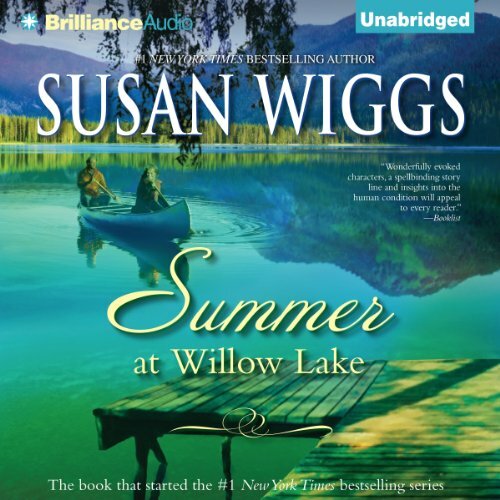 I have read Summer at Willow Lake several times! It is one of my all time favorite books and the Lakeshore Chronicles are one of my favorite series! I ended up getting the Audible version to listen to at work and I'm so glad I did. Really enjoyed the performance.... the narrator was outstanding! I'll definitely be purchasing the rest of the series. What a confusing mish-mash of words! What would have made Summer at Willow Lake better? Too many words! Too much jumping all over the place- it's the 30s, no the 90s, oh wait now it is the 70s, and occasionally let's throw in present day! Has Summer at Willow Lake turned you off from other books in this genre?